A few years ago I had an idea for a portrait series. The idea was good, but I flopped the execution of it. Jessica. © 2013 Jebb Graff. 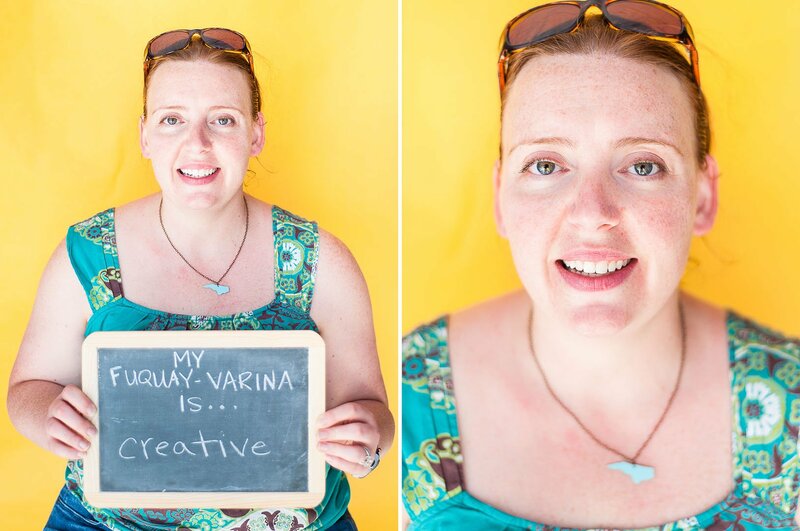 At a street festival called “Celebration of the Arts” in downtown Fuquay-Varina, I would have a booth that didn’t sell anything, but instead, I would offer free portraits/profile pics to passers-by in exchange that they would write what they loved about Fuquay-Varina on a small chalkboard. One pic with chalkboard – one without. I envisioned having enough to make a book that I’d publish as a souvenir for those of us who really do love our small town. A bit of a cross promotion thing. There was low participation mostly due to low promotion on my part. When I tried to save the low turn-out on the day of the street festival by extending the offer to scheduling a time to come by the studio things went off the rails. Either people tried to take advantage and turn it into a formal family portrait session (not the point), they were no-shows (commitment breakers turn Jebb totes grumps), or it happened to fall during our local campaign time so I had mostly politicians (all the politicians that participated were fantastic, but I was looking for a response from the average Fuquay-Varina sidewalk citizen). Admittedly, I pretty much just walked away from the whole thing and let it be. Lately, I’ve been experiencing a shift that I am seeing as a Kairos Moment. I’m experiencing some transition and unbelievable amounts of inspiration that are unfortunately gurgling in the mud-hole of resource scarcity and (the sense of) lack of time. When this happens (and it often does), I usually find myself digging through the past on a search for gems or motivators created by my own progress versus looking to comparison to others. I think we can surprise ourselves sometimes. “Oh wow – I made that? !” Then, “ohhh, I should’ve done this instead”. And sometimes, “I’m going to rework this”. The point here is, I’m going to be posting the photos I made for this series here on my blog. I may revive the project, but for now, I’ll work on reviving me.